This is a test of different light bulb options to see what uses less power. 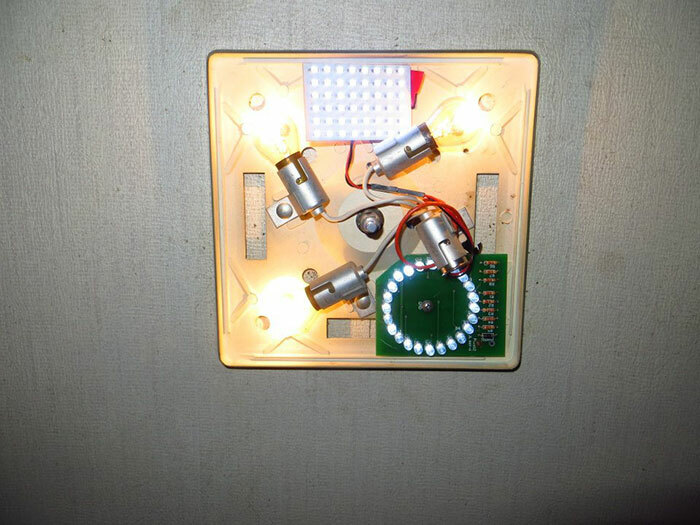 The 1965 Scotty I am restoring has this light in it. 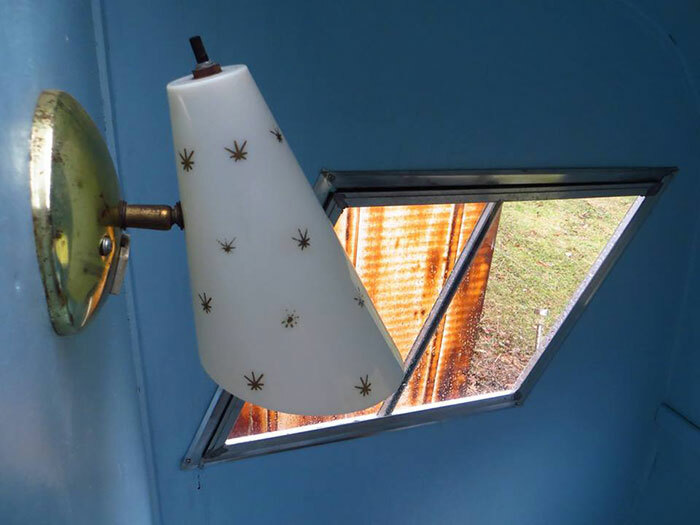 The lamp is hooked up to 120 volts and has a 60 watt bulb in it. This is nice if you have an electric campsite, but not for boondocking without power? Here is the test equipment. 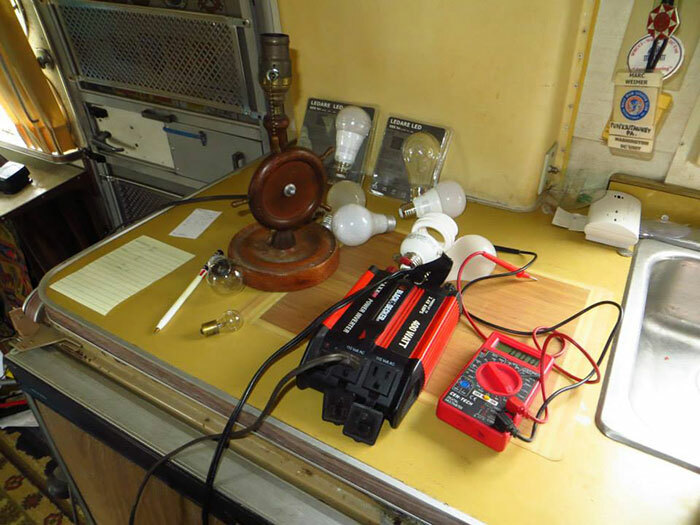 A Black and Decker 400 watt inverter, an ammeter, and an old lamp. First test, using an old fashioned incandescent bulb. This one is 120 volt, 40 watts. Measuring the amount of 12 volt electricity going in to the power inverter, and the power inverter is converting 12 volts to 120 volts and the light bulb lights up. This is using 4.29 amps. I tried to test this 60 watt bulb but it would not work with my set-up. Tested this 120 volt CFL bulb, same as a 60 watt regular bulb but using only 20 watts. It uses 2.06 amps, about 1/3 the power. 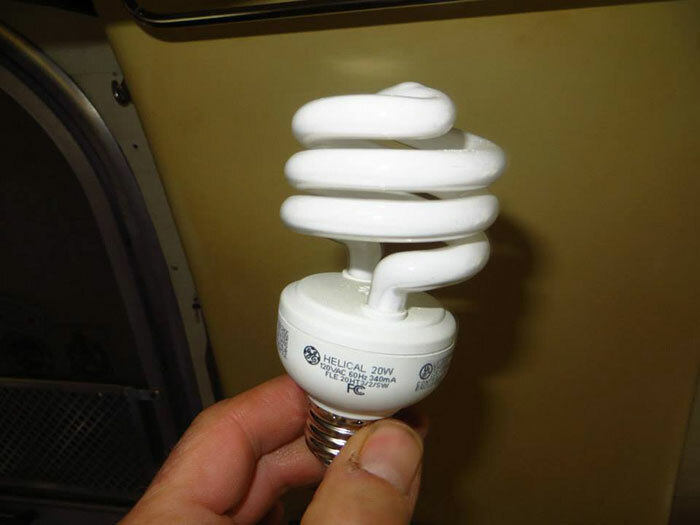 A 13 watt CFL which should be equivalent to a 40 watt regular bulb used 1.46 amps. 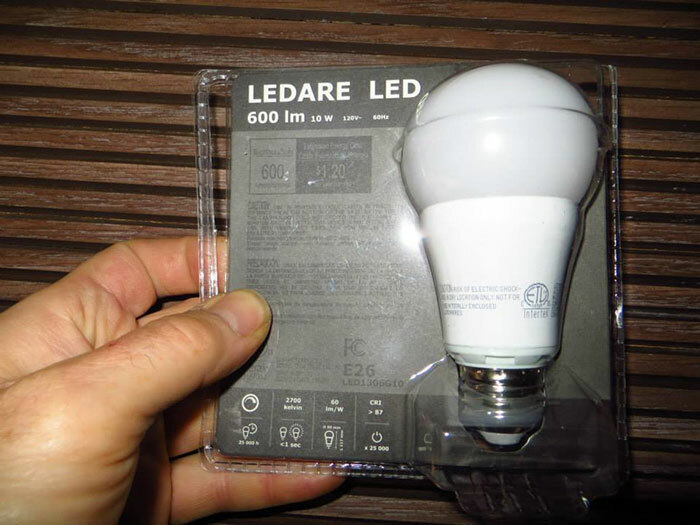 This 120 volt LED bulb I bought at Ikea for $5 is supposed to be equivalent to a 40 watt regular bulb in output, but uses 6.3 watts. It used only 0.77 amps. 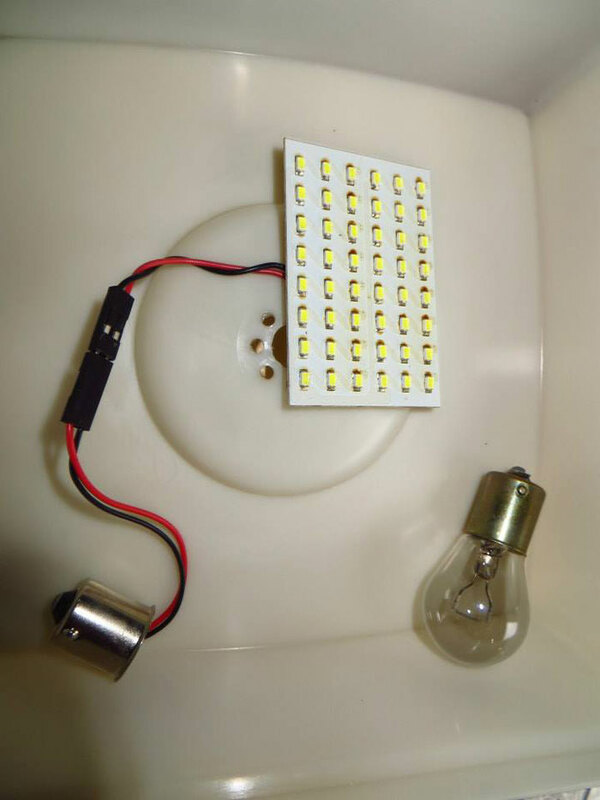 A 10 watt LED, equivalent to a 60 watt bulb used only 1.21 amps. 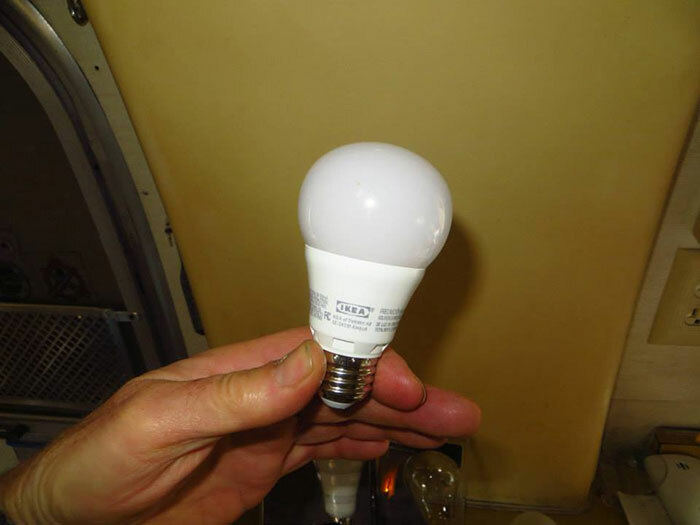 The overhead lamp in my Airstream has four 12 volt bulbs in it. It runs off the 12 volt in the trailer. This is one of the bulbs, a number 93. I have also seen number 1141 used. The 93 used 1.08 amps. A number 1141 used 1.47, which is more than running a 120 volt LED bulb on a power inverter. When LED bulbs first came out, I tried converting this fixture to LED. I replaced one of the number 93 bulbs with a 12 volt LED light. The round one in the picture is the older style. The square one is later and much better and brighter. 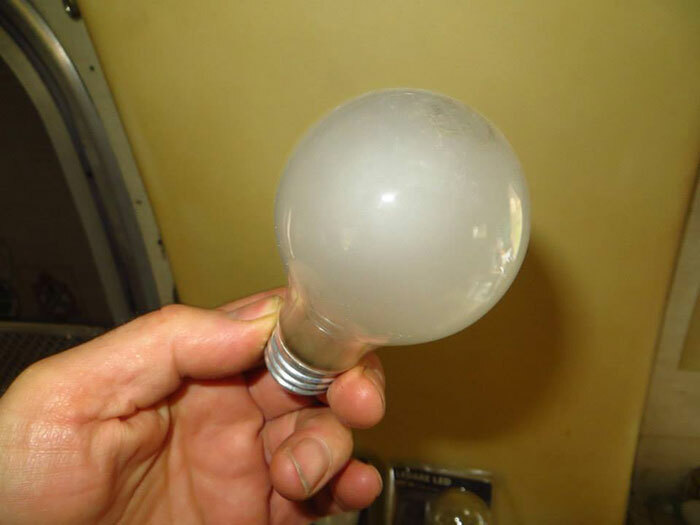 Here is another LED replacement bulb. It was around $15 and has sticky tape on it to stick it to your light. It comes with an interchangable base to fit whatever socket your light uses. 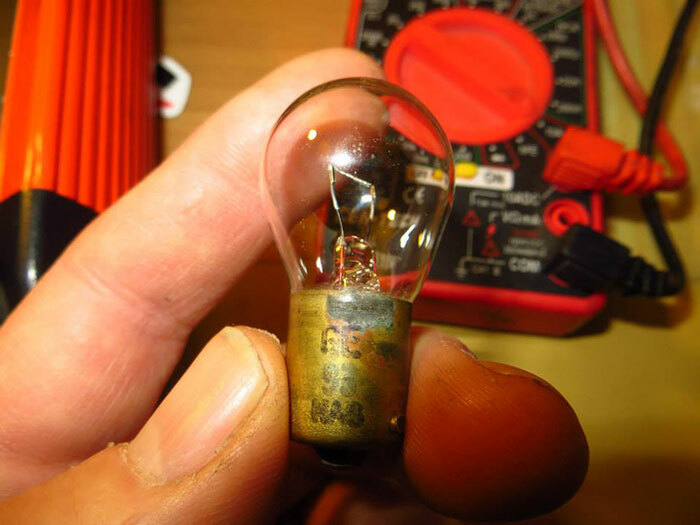 It uses 0.42 amps and is much brighter than the original bulb. Running four regular bulbs in this light uses 10 times the power that one LED uses. A 12 volt battery will last much longer this way, when boondocking. So this is the winner. 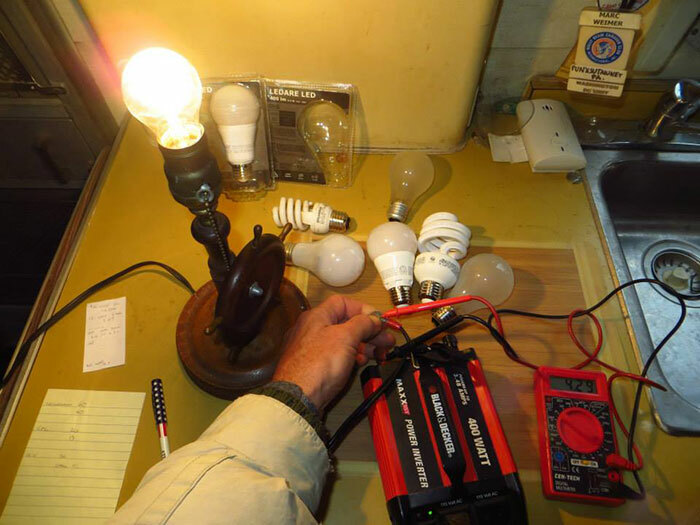 These 120 volt 6.3 watt LED bulbs can be used in the original fixtures and powered with a power inverter when the campsite does not have electric.